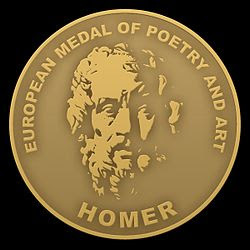 HOMER - The European Medal of Poetry and Art awarded to outstanding creators in the world of literature, theatre, film, music and the visual arts. 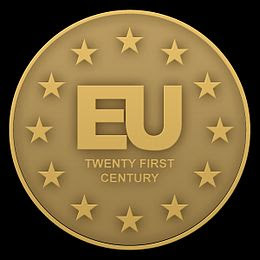 The medal was established in Brussel  in 2016 year. Jury award the artists, whose works is, with simplicity and beauty, universal messages to the world, reflecting the ancient patterns. The most important category is the level of artistry and the power of transmission, so that subsequent winners may enrich the pantheon of their spiritual father - Homer. Jump up^ "Information about the medal and laureat". bianet.org. Retrieved 22 January 2017. Jump up^ "Information about M. Scalabrino". poiein.it. Retrieved 22 January 2017. Jump up^ "Information about Gulala Nouri". iwp.uiowa.edu. Retrieved 22 January 2017. Jump up^ "information about A.V. de Tracy". athanase.org. Retrieved 22 January 2017. Jump up^ "Homer for Jidi Majia". chinawriter.com.cn. Retrieved 22 January 2017. Jump up^ "Homer for China writer". news.163.com. Retrieved 22 January 2017. Jump up^ "Homer for Davtian". wua.am. Retrieved 22 January 2017. Jump up^ "information about the medal". cnnturk.com. Retrieved 22 January 2017. Jump up^ "Homer for Berghamoglu". birgun.net. Retrieved 22 January 2017. 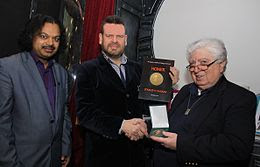 Jump up^ "information about St. Barkan award". pw.org. Retrieved 30 January 2017.